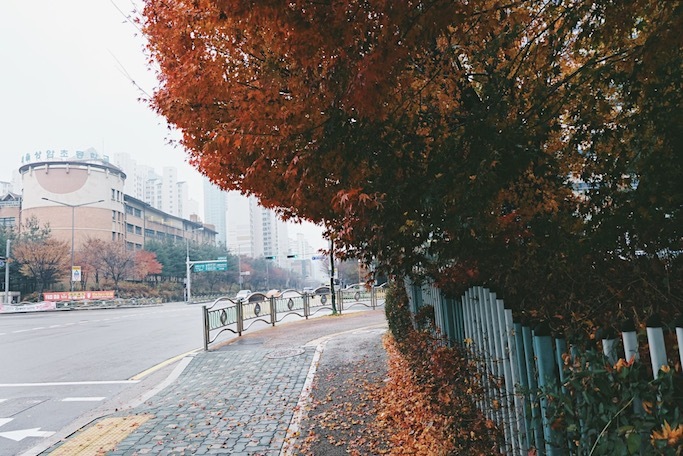 Before I begin my post on our last day in Seoul, I will try my very best to answer these frequently asked questions I recently got in my blog post comments: When's the best time to go for autumn? What are the specific dates I went for a spring trip so I can see cherry blossoms? My first Spring in Korea was last year, and it was from April 12-16, 2016. 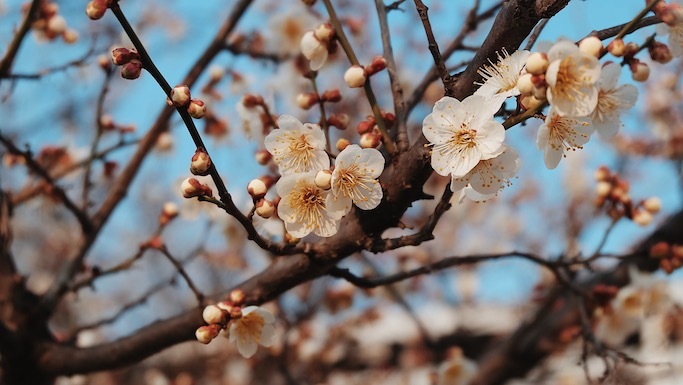 There were cherry blossom sightings already, especially at the Seoul Forest, Everland Resort, Namsan Tower, and even on random roads we passed by. This year though, I went to Korea pre-Spring from March 17-21, 2017 because I availed a sponsored plane ticket that you cannot use during peak seasons. 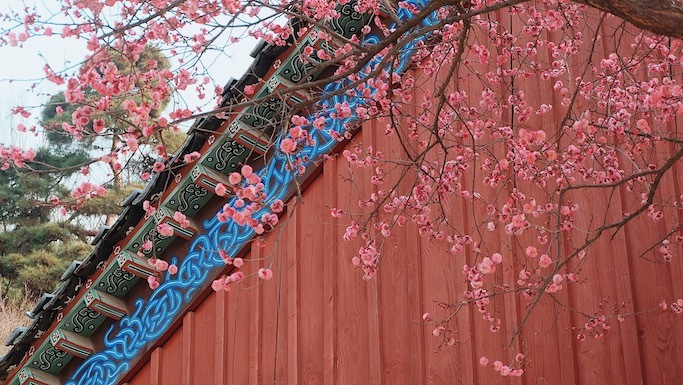 There were no cherry blossoms yet, but I found a few peach blossoms at the Bongeunsa Temple and near the Yongdap Bridge. I was too early, that even the streets popular for cherry blossoms were still dry from the cool winter months. So if you're planning a Spring trip in Korea, I guess mid-April is the way to go! My first Korea spring experience was last year, and we were there in the best time when the cherry blossoms were in full bloom! Meanwhile, my first autumn attempt in Korea was last year November 23-27, 2016. As expected, there were no reds, yellows, and golds, which were already replaced by withering plants--the signs of winter. I only saw a few autumn trees at the train station on my way to Gapyeong, and a lone red tree when I visited the Digital Media City. This year though, I went to Korea for Korea Tourism Organization x Cebu Pacific's Ladies Special campaign, and it was in the middle of fall! Our travel dates were from November 2-6, 2017. 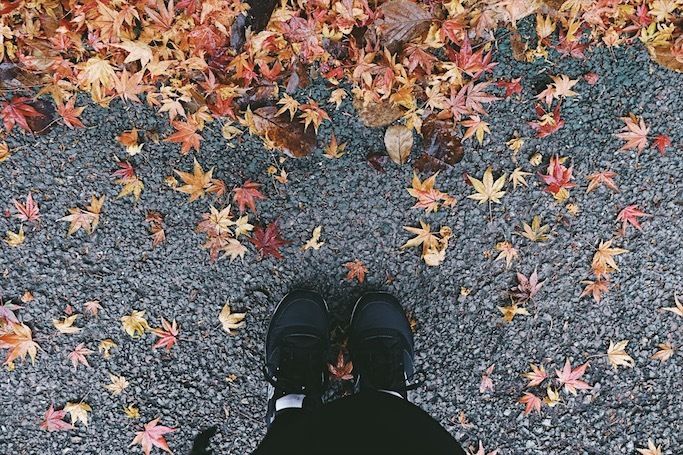 You will see beautiful autumn pathways in Everland Resort, Nami Island, and honestly, even in random streets on your way to the train station! So for those planning a Korea Autumn trip next year, best bet is early November! Came in too late for autumn last year, but found a lone tree with dried leaves, thus the shoefie! An advantage though of coming in too late for autumn? Experiencing early winter! 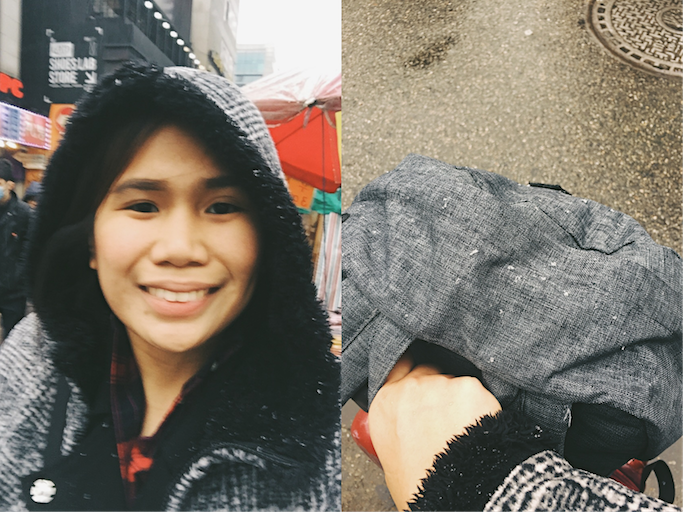 SNOW in Korea! A little note though, although I've given you specific dates, a season doesn't fall on the exact same dates year after year! 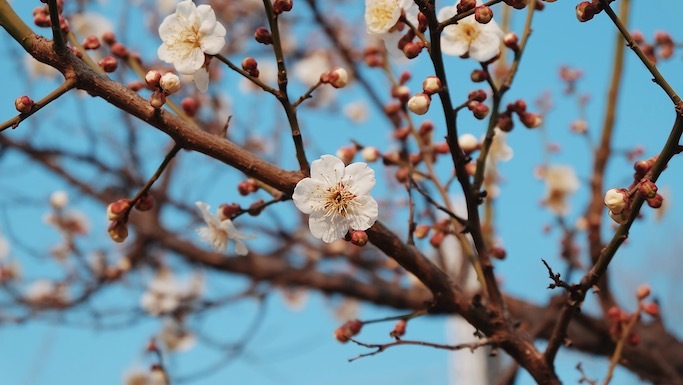 That's why whenever I receive messages asking which dates they should book to see cherry blossoms, I will often answer that you should check online forecasts for the year, which they release just a few months before spring or autumn. This is just a bit of a guide if ever you're one who will book early, but as usual, no guarantees if full spring or autumn will fall on same dates for 2018. Actually I find the weather for both Spring and Fall similar, but with Spring, as the days progress it gets warmer. Meanwhile on an Autumn trip, days get cooler and cooler, especially at night! Nights are also longer, sunset na mga 5pm palang! I usually get up earlier para hindi sayang ang day. For the outfit, I usually match sweater + coat, then either my pants or long skirts. To keep me from getting cold, I bring and just layer separate warmers like gloves, scarves (pinaka important for me), cloth or disposable face mask, and bonnets or caps. I also buy heat packs in convenience stores to place in my pockets, to keep my hands warm especially at night. I also have heattech tights whenever it's too cold na for my skirts. Others go for heattech undershirts, but personally I get suffocated when I use one especially when I enter restos and shops with heaters. I just rely on layering or thicker coats so I can easily take it off. So what's my favorite season between the two? I can't seem to choose! Spring, especially during the full bloom of cherry blossoms, is extra harder to catch for me than the full autumn season--since cherry blossoms last for barely 2 weeks only! It makes the season extra special. But a park lined with golds and reds is also a magical, glowing sight to behold! So just for this, allow me to not pick one and just settle by saying how lucky we are to have a wonderful world to live in! Thank you for this comment! I pray for your success, so you can travel in the future! God bless! Hello, Ms Ana! May I know where you buy your coats? Here manila? Thank you! Hi Ms. Ana! Have you ever travelled in heels and if yes, how was your experience? Also, until what time are the shops open at Dongdaemun and Myeongdong? Thank you!